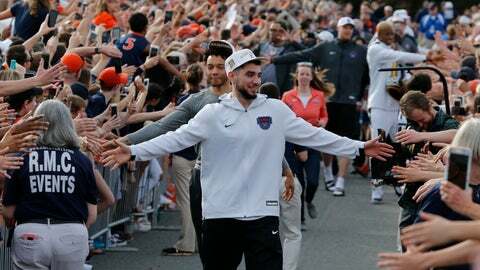 CHARLOTTESVILLE, Va. (AP) — A Virginia city once marred by deadly violence and tiki torch-carrying white supremacists chanting Nazi slogans savored a moment of bliss Tuesday as it welcomed home national men’s college basketball champion University of Virginia. Charlottesville was in full party mode a day after the U.Va. Cavaliers defeated Texas Tech in the title game. Supporters, waking up from a night of celebration, flocked to the school’s basketball stadium parking lot to give the team a hero’s welcome. While awaiting the team, fans erupted in random cheers while trading stories about how stressed they had been watching the Cavaliers’ successful tournament run, which featured come-from-behind victories in the final seconds of several games. Monday’s championship game was settled in overtime. “There’s an amazing story that has been written from this and I think it’s going to encourage a lot of people,” Bennett said. “We were due for some good coverage for a change,” said Matilda Foster, who waited for hours to be at the front of the crowd welcoming the Cavaliers back from Minneapolis. She said the team’s success has unified the city and surrounding area. “This is a really big event for this region and the city that’s been kind of back on their heels,” Toscano said. In 2014, the magazine Rolling Stone published a story portraying U.Va. as a school where sexual assaults were rampant and unpunished. A woman identified as “Jackie” in the article told the magazine she was raped by seven men at a fraternity house in September 2012. But an investigation by police in Charlottesville found no evidence to back up the claims.